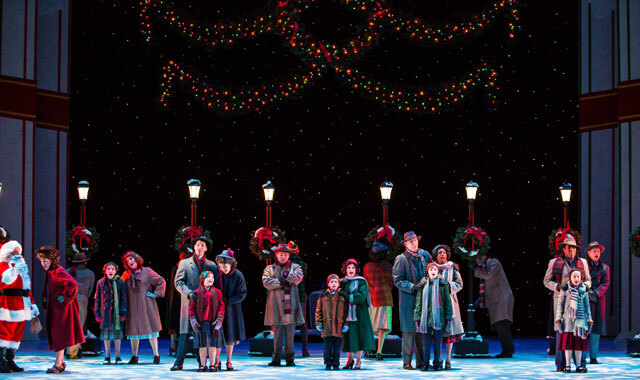 “A Christmas Story — The Musical” runs at Woodstock Opera House Nov. 4-20. Oct. 1, 8 p.m. The frontman of the hard rock group Foreigner brings back the group’s pop radio hits and singles of his own 1980s solo career. Arcada Theatre, 105 E. Main St., St. Charles, (630) 587-8400, arcadalive.com. Oct. 2, 3 p.m. Best known for her Academy Award-winning role as Anita in “West Side Story,” this actress and singer brings down the house with virtuoso performances of the classic songs forever associated with her. Arcada Theatre, St. Charles, (630) 587-8400, arcadalive.com. Oct. 4, 7:30-9 p.m. Join the Elgin Symphony Orchestra trombone section and Radio Players West in solving crime stories along with live music and theater. Kimball Street Theater at Elgin Adademy, 261 Dundee Avenue, Elgin, gailborden.info. Oct. 6, 7:30 p.m. When she was 10-years-old, she was the runner up on “America’s Got Talent.” She has since become a Billboard Classical charts superstar, with her first studio album going gold. Arcada Theatre, St. Charles, (630) 587-8400, arcadalive.com. Oct. 7-23. Check website for times. The Biblical journey of Joseph and his coat of many colors comes to life in this musical parable. Woodstock Opera House, 121 Van Buren St., Woodstock, (815) 338-5300, woodstockoperahouse.com. Oct. 7-9, check website for times. Enjoy this iconic silent film from 1931 as the Elgin Symphony Orchestra performs the score Chaplin himself composed. Fri.: Schaumburg Prairie Center for the Arts, 201 Schaumburg Ct., Schaumburg. Sat.-Sun. : Hemmens Cultural Center, 45 Symphony Way, Elgin. Tickets: (847) 888-4000, elginsymphony.org. Oct. 7, 7:30 p.m. DuPage Symphony Orchestra principal harpist Nichole Luchs performs “Starry Nights,” an educational and engaging program with a variety of music and demonstrations. Q&A session after the performance. Naperville Public Library, 95th Street Library, 3015 Cedar Glade Road, (630) 961-4100. Oct. 7, 8 p.m. As one of the most well-known Philadelphia soul groups of the 1970s, this now four-piece ensemble celebrates its hits from three albums “Betcha by Golly, Wow,” “I’m Stone in Love with You” and “You Make Me Feel Brand New.” Arcada Theatre, St. Charles, (630) 587-8400, arcadalive.com. Oct. 8, 8 p.m. Buddy lets it “All hang out” with songs and stories – without a setlist. Watch him enter the audience and walk up to the balcony as he continues playing his Blues guitar. Arcada Theatre, St. Charles, (630) 587-8400, arcadalive.com. Oct. 8, 7:30 p.m. Actor and recording artist Christopher Kale Jones offers his passionate voice to the catalogue of Rock and Roll Hall of Famer Bobby Darin. Prairie Center for the Arts, 201 Schaumburg Court, Schaumburg, (847) 895-3600, villageofschaumburg.com/depts/cultural/pca. Oct. 9, 6:30-9:30 p.m. Learn step-by-step instructions while a band plays. Come with a partner, with friends, with family or by yourself. No special clothing is needed – just comfortable shoes. Kuhn Village Barn, Che Che Pinqua St., Batavia, orgs.fnal.gov/folkclub/. Oct. 9, 5 p.m. American Rock & Roll singer, songwriter and guitar legend, Johnny Rivers, returns to the Arcada. He held a sold out performance in 2015. Arcada Theatre, St. Charles, (630) 587-8400, arcadalive.com. Oct. 13, 7-8 p.m. To celebrate the 50th anniversary of the Civil Rights Act of 1964 and the Voting Rights Act of 1965, folksinger Chris Vallillo presents first-hand accounts of historical struggles and discusses the impact of music during one of the nations most important social issues. Arlington Heights Historical Museum, 110 W. Freemont St. Arlington Heights. ahmuseum.org/ (847) 225-1225. Oct. 14, 8 p.m. This American country music singer, songwriter and actor introduces his latest release, “The Calm After.” Arcada, St. Charles, (630) 587-8400, arcadalive.com. Oct. 15, 8 p.m. Featuring Gustav Holst’s enduringly popular masterpiece “The Planets,” enjoy a seven-movement orchestral suite depicting the astrological profiles of our solar system. Wentz Concert Hall, North Central College, 171 E. Chicago Ave., Naperville, (630) 778-1003, dupagesymphony.org. Oct. 16, 3 p.m. This multi-talented singer, composer, actor, writer, TV personality and spokesman takes the stage with his daughter, Debby Boone, for a retrospective look on his career. Arcada Theatre, St. Charles, (630) 587-8400, arcadalive.com. Oct. 20-30, check website for times. This whodunit comedy follows Broadway star William Gillette, known for his leading role in the play “Sherlock Holmes,” and his fellow cast members as they try to determine the murderer among them during a weekend away at Gillette’s Connecticut castle. Stage Coach Players, 126 S. 5th St., DeKalb, (815) 758-1940, stagecoachers.com. Oct. 21, 8 p.m. The legendary comedian and creator of Sledge-O-Matic fills his final tour with even more prop comedy gags. Arcada Theatre, St. Charles, (630) 587-8400, arcadalive.com. Oct. 23, 2 & 4 p.m. Join the orchestra for a family-friendly performance featuring excerpts from “The Planets,” “Star Wars,” “E.T.,” and much more. Wentz Concert Hall, Naperville, (630) 778-1003, dupagesymphony.org. Oct. 23, 5 p.m. One of the finest vocal groups to emerge from the talent-rich New York scene, this act performs doo-wop hits of the 1950s and soul music of the ‘60s. Arcada Theatre, St. Charles, (630) 587-8400, arcadalive.com. Oct. 23, 2 p.m. From “Old Blue Eyes” to blue-eyed soul, multi-talented Michael B. Levin, along with his swinging live band, takes you on a memorable journey through some of the greatest music of all time. Batavia Centre, 1399 W. Wilson St., Batavia, (630) 937-8930, bataviafineartscentre.org. Oct. 26, 7 p.m. With sardonic wit and incisive social critiques, Sedaris is one of America’s pre-eminent humor writers. Raue Center For The Arts, 26 N. Williams St., Crystal Lake, (815) 356-9212, rauecenter.org. Oct. 27, 8 p.m. Experience the thrill of Dracula in this horrific one-woman show by resident storyteller Megan Wells. Woodstock Opera House, Woodstock, (815) 338-5300, woodstockoperahouse.com. Oct. 28, 6-9 p.m. Enjoy a juried fine art show of all mediums. Crowds of art enthusiasts travel from all over Chicagoland and Wisconsin to view the artwork. The Starline Gallery, 300 W. Front St., Harvard, (815) 347-8535, www.nancymerkling.com. Oct. 29, 8 p.m. This seven-piece jazz band interprets classic styles of the 1920s and ‘30s with its latest release, “18th & Racine.” Woodstock Opera House, (815) 338-5300, woodstockoperahouse.com. Oct. 29, 8 p.m. Direct from Barcelona, this all-female ensemble creates a fascinating blend of Flamenco and Mediterranean styles by combining classic and contemporary rhythms and melodies that range from powerful and passionate to playful. Fermilab, Ramsey Auditorium, Batavia, (630) 840-2787, fnal.gov/culture. Oct. 30, 3-5 p.m. The Fox Valley Concert Band kicks off its 2016-17 season with an afternoon of Halloween classics. Norris Cultural Arts Center, 1040 Dunham Road, St. Charles, (630) 584-7200, norrisculturalarts.com. Oct. 30, 5 p.m. Pasquale, accompanied by his stellar band, will take the audience on a musical journey performing songs spanning from 1880 to present that have influenced him as an artist. The repertoire will include Italian, Spanish, Neapolitan and American Songs from his “Il Tempo” album. Arcada Theatre, St. Charles, (630) 587-8400, arcadalive.com. Oct. 30, 7 p.m. Karen and Richard Carpenter often kept things simple on stage, performing just as a duo. To create the full, rich sound, they had several additional musicians join in. The Music of the Carpenters features Lisa Rock on lead vocals with her 6-piece backing band. Raue Center For The Arts, Crystal Lake, (815) 356-9212, rauecenter.org. Nov. 2, 7:30 p.m. Chicago Theater standout and singer Evan Tyrone Martin resonates the vocal style of musical legend Nat King Cole. Metropolis Performing Arts Center (Metropolis), 111 W. Campbell St., Arlington Heights, (847) 577-2121, metropolisarts.com. Nov. 4, 8-10 p.m. Long known as one of the best live acts in the business, BoDeans continues to tour year round and deliver high-energy performances. Chart topping songs like “Fadeaway” “Only Love” and “Dreams” won them Rolling Stone’s readers poll for Best New American Band in 1987. Raue Center For The Arts, Crystal Lake, (815) 356-9212, rauecenter.org. Nov. 4, 8 p.m. The Ballet Folklorico celebrates Mexican folklorico dance with costumes, music and elegant choreography. Paramount Theatre, 23 E. Galena Blvd., Aurora, paramountarts.com. Nov. 4, 8-10 p.m. The Manhattan Transfer and Take 6, two of the most acclaimed, award-winning vocal groups in pop music, share the stage for the first time with a thrilling performance. Wentz Concert Hall, Naperville, (630) 778-1003, finearts.northcentralcollege.edu. Nov. 4-20, check website for times. The musical follows 9-year-old Ralphie Parker and the ultimate Christmas gift – an official Red Ryder carbine-action 200-shot Range Model air rifle. Woodstock Opera House, Woodstock, (815) 338-5300, woodstockoperahouse.com. Nov. 5, 8 p.m. With a resume that includes four Grammy nominations, a Golden Globe for “Entertainer of the Year,” 24 platinum records, 150 million albums sold and a star on the Hollywood Walk of Fame, it’s difficult to find a more established performer than Engelbert Humperdinck. Paramount Theater, Aurora, paramountarts.com. Nov. 6, 3 p.m. Made up of former Jersey Boys cast members, this “Modern Day Rat Pack” brings audiences along for an electrifying ride through the American radio songbook. Paramount Theater, Aurora, paramountarts.com. Nov. 10, 7:30 p.m. When he was 16, Jonny Lang found success with the release of his debut album “Lie To Me.” He focuses on the impact that his songs bring to people’s lives. Arcada, St. Charles, (630) 587-8400, arcadalive.com. Nov. 5, 6 p.m. Gear up for a family-fun magic variety show featuring the Midwest’s finest magicians and entertainers. Raue Center For The Arts, Crystal Lake, (815) 356-9212, rauecenter.org. Nov. 10, 7 p.m. Brighten your holidays with Lightwire Theater’s A Very Electric Christmas. Audiences of all ages will treasure this magical captivating tale of family, friendship and hope set to timeless holiday hits. Raue Center For The Arts, Crystal Lake, (815) 356-9212, rauecenter.org. Nov. 10, 6:30 p.m. The Elgin Symphony Chamber Ensemble performs pieces from Mozart’s greatest work. Enjoy the performance with dishes from Levy Restaurants. Sears Centre Arena, 5333 Prairie Stone Pkwy, Hoffmann Estates, (888) 732-7784, searscentre.com. Nov. 11, 8:30 p.m. Lucy’s Comedy Café is one of the Raue Center’s longest running programs and the cornerstone of the theater’s comedy programming. The series has brought in regional and national comedians, such as Dwayne Kennedy, Rocky LaPorte and Patti Vasquez. Raue Center For The Arts, Crystal Lake, (815) 356-9212, rauecenter.org. Stars and Stripes: The music of our country with the Matt Kowalski Quartet. Nov. 11, 2 p.m. Celebrate Veterans Day with the Matt Kowalski Quartet, which plays styles including jazz, classical and indie rock. Metropolis Performing Arts Center (Metropolis), Arlington Heights, (847) 577-2121, metropolisarts.com. Nov. 12, 8 p.m. Original founding members Carl Giammarese and Nick Fortuna continue to deliver a powerful replay of their hits and solid gold memories. Raue Center For The Arts, Crystal Lake, (815) 356-9212, rauecenter.org. Nov. 12, 8 p.m. One of the most acclaimed progressive rock bands in history, this group goes back to 1969, when it began to blend progressive rock with classical and symphonic influences. Arcada Theatre, St. Charles, (630) 587-8400, arcadalive.com. Nov. 12, 8 p.m. Along with is successful acting career, Gardell has toured as a stand up comedian for years. He makes audiences laugh with stories on childhood, wild teenage years and raising a family. Paramount Theater, Aurora, paramountarts.com. Nov. 12, 7 p.m. If you’ve never met a talking dog, this show is for you. If you ever wonder how a dog looks at life, Irving, with a little help from his friend Todd Oliver, gives it to you straight. Todd Oliver & Friends has been featured on The Late Show With David Letterman, The Tonight Show With Jay Leno and The Late Late Show With Craig Ferguson. Egyptian Theatre DeKalb, 135 N. 2nd St., DeKalb, (815) 758-1215, egyptiantheatre.org. Nov. 13, 3 p.m. Alicia Marcos Birong, author of “Changing the Chatter: Help Your Daughter Look Beyond the Mirror for Self-Esteem,” discusses the importance of raising a daughter with strong self-esteem. Raue Center For The Arts, Crystal Lake, (815) 356-9212, rauecenter.org. Nov. 13, 3 p.m. Keillor shares stories, advice, a couple jokes and even a song or two. He performs with charisma and humor that’s well-known and loved. Paramount Theater, Aurora, paramountarts.com. Nov. 13, 3 p.m. This concert stars Chicago Symphony Orchestra Principal Tuba, Eugene Pokorny. Witness the excitement of the World Premiere of “Brass Fanfare II”, preformed by Mr. Pokorny and local high school brass players. Elmhurst Christian Reformed Church, 149 W. Brush Hill Road, Elmhurst, (630) 941-0202, elmhurstsymphony.org. Nov. 15, 7:30 p.m. Guitarist, songwriter, vocalist and three-time Grammy-Award winner Brian Setzer and his orchestra create retro holiday cheer with their Christmas Rocks! Tour. Arcada Theatre, St. Charles, (630) 587-8400, arcadalive.com. Nov. 18, 7:30 p.m. Kim Wilson still spearheads the group after more than 30 years. The Fabulous Thunderbirds has a powerful sound and is influenced by a diversity of musical styles. Prairie Center for the Arts, (847) 895-3600, villageofschaumburg.com/depts/cultural/pca. Nov. 20, 3 p.m. Enjoy music of Beethoven, Bizet and Brahms’ violin concerto in D Major performed by violinist Mo Yang. Wentz Concert Hall, Naperville, (630) 778-1003, dupagesymphony.org. Nov. 20, 5 p.m. Vikki Carr has captivated audiences for more than 50 years with her voice and presence. Her music covers four languages and she is one of the first artists to bridge the cultures of the United States and Latin America. Arcada Theatre, St. Charles, (630) 587-8400, arcadalive.com. Nov. 25-Dec. 4, check website for times. Join Scrooge as he journeys the Christmas of past, present and future with three ghosts by his side. Woodstock Opera House, Woodstock, (815) 338-5300, woodstockoperahouse.com. Nov. 25-Dec. 27, check website for times. This holiday classic takes a new approach as a 1940s radio broadcast. With sound effects from the 1940s, actors brings Capra’s memorable story to life on stage. Metropolis Performing Arts Center (Metropolis), Arlington Heights, (847) 577-2121, metropolisarts.com. Nov. 26, 8 p.m. Rydell has earned a reputation as a classic performer. Not only is he a great singer, but he’s also a proven drummer, an agile dancer and a great actor with a knack for comedy. Arcada Theatre, St. Charles, (630) 587-8400, arcadalive.com. Nov. 26-Dec. 4, check website for times. “Bah! Humbug!” Scrooge shares his feelings of Christmas tidings and charitable giving, but he has to look in the mirror when three ghosts on Christmas Eve lead him through his past, present and future. With their help, Scrooge realizes his faults and he wakes up Christmas morning in a cheerful spirit. Stage Coach Players, DeKalb, (815) 758-1940, stagecoachers.com. Nov. 30- Dec. 22, check website for times. A fresh take on the Dickens Classic. A narrator takes guests through the classic Christmas Eve tale of Ebenezer Scrooge and his pursuit of money. Three ghosts visit him, showing him the errors of his past, the present times and darkness the future could hold. Metropolis Performing Arts Center (Metropolis), Arlington Heights, (847) 577-2121, metropolisarts.com. This entry was posted on Monday, October 10th, 2016 at 11:56 am	and is filed under Arts & Entertainment. You can follow any responses to this entry through the RSS 2.0 feed. Both comments and pings are currently closed.